Glam Media, which is mostly an ad network but also owns a group of sites focused on women, is actively attempting to raise $200 million in a private round of financing. The company previously raised $18.5 million in December 2006. The company has hired Allen & Company to represent them in the transaction, and has been distributing a private placement document to potential investors. They’ve actually distributed it a little too liberally – we have a copy and have embedded it at the bottom of this post. Glam has driven revenue aggressively and say they’ll get to $21 million this year, and $150 million next year. Losses this year are expected to be around $3.7 million. But the company is driving that revenue by selling ads for partner websites, not on their own page views. A minimal amount of research into their business shows that the company is an ad network, not a content site. In the private placement document, Glam describes itself in the first sentence as “Glam Media is a Web 2.0 distributed media company that is number one in reach for women as reported by comScore Media Metrix.” I believe this is a perversion of the term “Web 2.0” (see below – any company this deep in SEO shenanigans is very Web 1.0 focused) and the company certainly is not the largest womens site on the Internet. 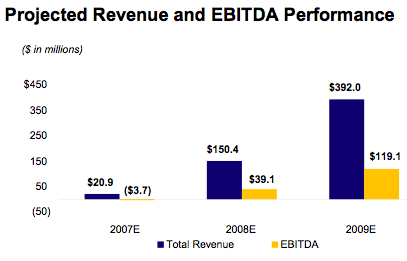 While revenue growth looks good, Glam isn’t really a content site. They’re little more than an ad network that is claiming the traffic for all of its partners to make it look like a huge womens destination site. Glam Media has grown from 782,000 unique users in June 2006, to 19.1 million unique users in June 2007. By way of comparison, MySpace grew from 1.6 to 15.6 million unique users the year prior to its acquisition by News Corporation in July 2005. Glam has been ranked as the highest in traffic growth in the Top Web 100 web properties by comScore Media Metrix for the past 6 months. By May 2007, the Company had reached #1 ranking (in terms of traffic) in the women’s category, per comScore Media Metrix, within only 20 months after launch, beating iVillage/NBC which has held the top position for over nine years. Glam continues to be the #1 ranked website in the women’s category with a 23% lead ahead of iVillage/NBC, 85% ahead of AOL Living and 185% ahead of all CondeNast websites combined. The problem is that it’s all complete nonsense. The growth in comscore numbers has nothing to do with more traffic coming to Glam’s websites. Rather, Glam sells advertising for a number of very large partners (see list of some of the largest to the right) and is able to claim credit at Comscore for their user numbers. So the comscore numbers for sites such as MyYearbook, Kaboodle (recently acquired) and Meez, among dozens of others, are being used to support the 19 million unique visitor number. Glam also owns a number of pure SEO sites like free-beauty-tips.com, celebrity-hairstyles.org and others. These sites drive a lot of traffic from search engine queries and pump up the Comscore numbers dramatically, but provide, as far as I can tell, absolutely no original content. In fact, the numbers are so inflated that Glam.com, the main website owned by the company, brings in just 654,000 unique monthly visitors, or about 3.4% of the 19 million the company claims. We’ve uploaded June Comscore numbers for the entire Glam network that shows where these 19 million users are really coming from – other sites. See Glam’s Comscore breakdown here. There is no way that this site can in good conscience claim the user numbers that they do in the private placement document. Comscore has long been criticized for allowing companies to “steal” the traffic of others to make themselves look much bigger than they really are. This is a perfect example of how that kind information could be used to mislead the public and potential investors. Glam is an advertising network, and runs a very good SEO operation, but they are not the no. 1 destination site on the Internet for women. Update: Matt Marshall at Venture Beat writes a very long post coming to a completely different conclusion. I’m not sold, but judge for yourself. Different viewpoints are good.